Dave Roberts and Hilary G (Child) Kirk. GRO Indexes to Births, 1837 to date, "Sep qtr 1849. 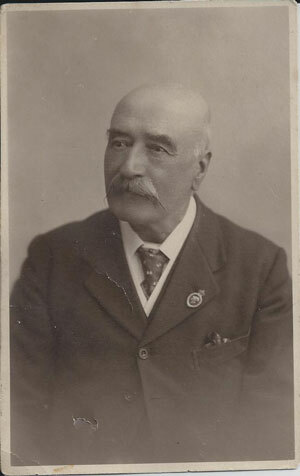 Sackett, Edward Gaskell. Mother: Gaskell. Romford. 12:203." Andrews Newspaper Index Cards (England), digital image, Ancestry.com, "Sackett, Edward Gaskell, of 34 Tavistock Drive, Mapperley Park, Nottingham, chartered accountant, died 6.10.1925 at the Infirmary, Bagthorpe, Nottingham, leaving Edward Stewart Gordon Sackett & Henry Leonard Sackett, his natural & lawful sons & Norah Alice Horsburgh (wife of Gordon Stanley Horsburgh), Mabel Francis (wife of Frederick Hilton Francis), Eileen Fleming (wife of Malcolm Fleming), & Edith Gordon Sackett spr his lawful daus & only N.K., said sons failed to appear to Citation & said sons removed. Admon 3.5.1927 to George Franklin Bristow accountant of 1 Middle Pavement, City of Nottingham, a Creditor. £122=10=2. Bond dated 31.3.1927 for £245=0=4 sureties:- Charles William Hilton & George Lawson both of York House, King Street, City of Nottingham, estate agents." Private papers of Hilary Kirk, Horsham, Sussex, family tree of Rev E S Sackett , date. GRO Indexes to Marriages, 1837 to date (National Archives), "Dec qtr 1877. Sackett, Edward Gaskell. W Derby. 8b:775." GRO Indexes to Marriages, 1837 to date (FreeBMD), "Dec qtr 1877. Horsburgh, Alice. W Derby. 8b:775." GRO Indexes to Deaths, 1837 to date (National Archives), "Jun qtr 1923. Sackett, Alice, 69. Nottingham." Edward G Sackett, son, 1, b. Barking, Essex. Fanny Manx, serv., unm., 29, serv., b. Horsforth. Amelia GIBSON, serv, unmarried, 22, b. Rothwell, York, general serv. Emily Taylor, serv, single, 17, dom, b. Lincolnshire. Website Kelly's Directory of Nottinghamshire (Ancestry.co.uk) (http://www.ancestry.co.uk), 1891. Nottinghamshire. Trades Directory. "Sackett Edwd. Gaskell, chartered acctnt. 17 Low pavement. Sutton Park Freehold Land Society (Edward G. Sackett, sec. ), 17 Low pavement." 1891. Nottinghamshire. "Sackett Edward Gaskell, 35 Sherwood rise, Nottingham." "Low pavement. North side. 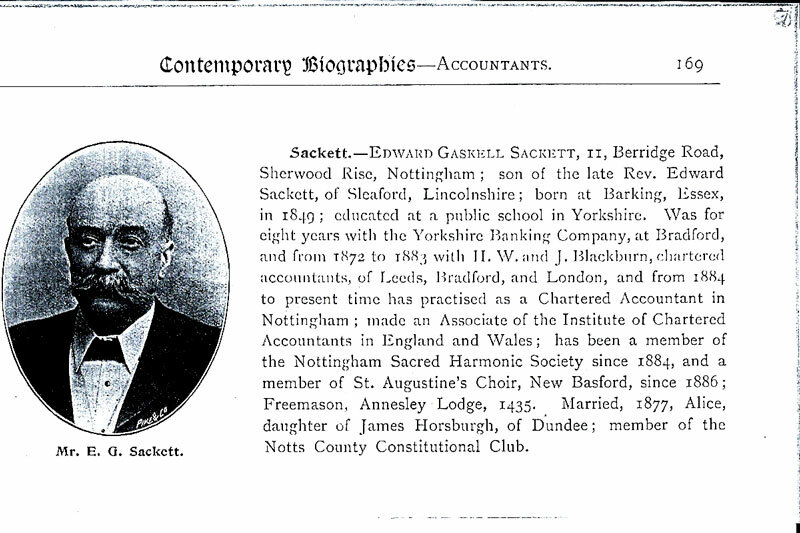 17 Sackett Edward Gaskell, chartered accountant." "Sherwood rise. 35 Sackett Edward Gaskell." Website White's History, Gazetteer and Directory of Nottinghamshire (Ancestry.co.uk) (http://www.ancestry.co.uk), 1894. Nottinghamshire. Nottingham Alphabetical Directory. "Sackett Edward Gaskell, chartered accountant and insurance agent, 17 Low pavement; h 11 Berridge road." 1894. Nottinghamshire. Nottingham Street Directory. "Low Pavement. 17 Sackett Ed. Gaskell, chart. acctnt." Minnie Redman, servant, 19, single, general servant domestic, b. Nottinghamshire, Stapleford. The London Gazette, digital image, (https://www.thegazette.co.uk), 3 Jun 1913. "England & Wales National Probate Calendar (Index of Wills & Administrations) 1858–1966", digital image, Ancestry.com, "Sackett Edward Gaskell of 34 Tavistock Drive Mapperley Park Nottingham died 6 October 1925 at the Infirmary Bagthorpe Nottingham Administration London 3 May 1927 to George Franklin Bristow accountant. Effects £122 10s. 2d."